This absolutely stunning gown was the dress of my dreams. I had so many compliments on the day. It is beautifully made with a hand sewn sequin overlay and a double layer silk lining. The dress is extremely flattering. I am curvy size 12 and it skimmed me in all the right places whilst not being too tight! I could also wear Spanx underneath and you couldn’t tell! It has a stunning puddle train which looks great with a veil over the top. 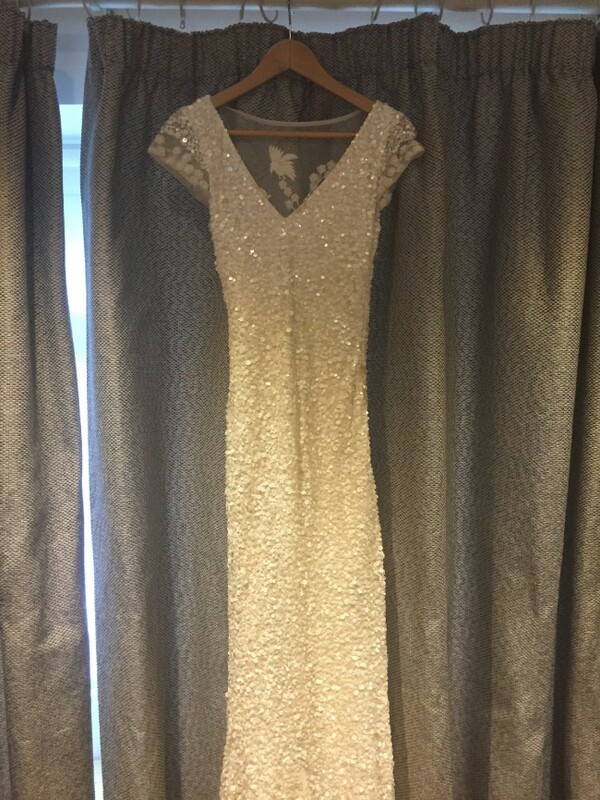 I paid a lot of money for the dress but have reflected the fact that it is worn in my asking price. I have handwashed the lining and it has only a few marks left at the bottom please note you cannot actually see the lining at all when wearing so this isn’t a problem. There are a few areas as shown in the pictures where the sequins are missing. There is also a small hole at the bottom along a seam which could be repaired. I have the belt that came with the dress which I didn’t wear which could be used to replace the sequins. There are also some marks right at the bottom on the hem- this could be rectified by rehemming the dress, which my seamstress did with no issues. I took it to a dry cleaners but they advised that as it was so delicate it wasn’t worth risking the sequins just for these small areas. There are no major marks on the body of the dress. The V neck has been brought up as it was low to begin with. It has been brought in at the waist. It has been re hemmed - I am 5 foot 5 and wore 4 inch heels. Once you send a message, Eleanor can invite you to purchase the dress.